May 29; A systematic and continuous review of the Pre-poll electoral process by PILDAT, spanning over a period of a year starting from April 2017 up to March 2018, indicates that the pre-poll process has, so far, been Unfair overall. The PILDAT Pre-Election Assessment Report with a Score Card on Pre-Poll Fairness Perception is based on an 11-point Pre-poll Fairness Framework and has received an overall score of 51.5% on a scale of 100. 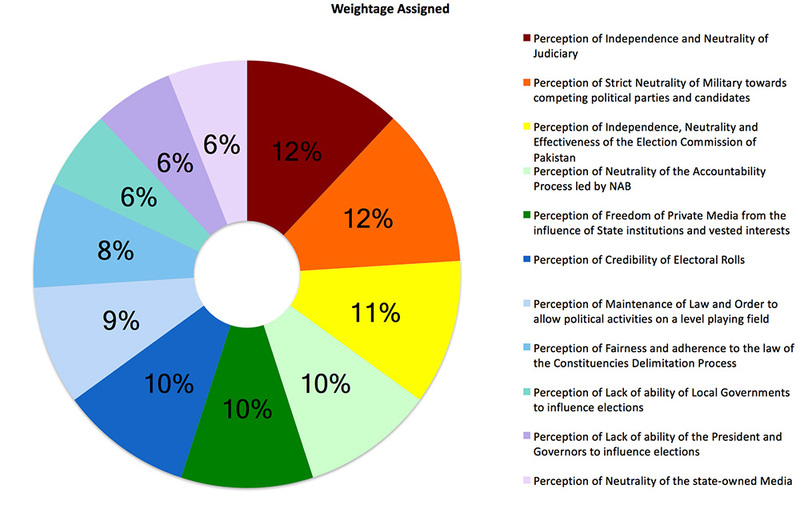 Scores on each of the 11 parameters are as follows: The 2 parameters that have fallen in the Highly Unfair scale based on the scores received are Perception of Neutrality of Military towards competing political parties and candidates receiving the lowest score of 33.4%, followed by the parameter of Perception of Freedom of Private Media from the influence of State institutions and vested interests receiving a score of 37.8%. The Unfair scale includes Perception of Neutrality of the state-owned Media , which has received the score of 41.5%, followed by Perception of Neutrality of the Accountability Process led by NAB which has received the score of 43.1%. Perception of Independence and Neutrality of Judiciary also falls in the scale of Unfair with score of 45.8%. The parameters that have received the highest scores in terms of providing the required level playing field to all for a free and fair election relate to the election management body – the Election Commissionof Pakistan (ECP) – charged with the Constitutional responsibility of holding Elections. Perception of Credibility of Electoral Rolls, has received the highest score of 67.3%. Perception of Independence, Neutrality and Effectiveness of the Election Commission of Pakistan has received a score of 65.3%, the second highest ranking parameter. 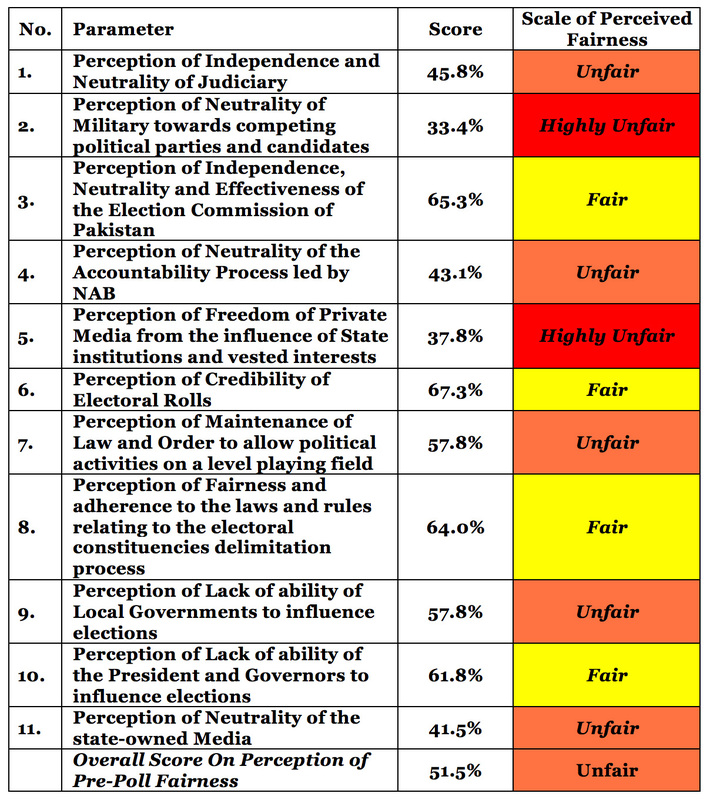 Another related indicator in the parameter of Perception of Fairness and adherence to the laws and rules relating to the electoral constituencies delimitation process has also received a high score of 64.0% with the overall highest 3rd ranking score amongst 11 parameters. It must be noted these are the only 3 parameters out of 11 whose scores fall in the Fair scale. No parameter has received score on the Good (81-100) scale. Parameter of Perception of Lack of ability of the President and Governors to influence elections has received the next highest score of 61.8% while Perception of Lack of ability of Local Governments to influence elections has received a score of 57.8%. The parameter of the Perception of Maintenance of Law and Order to allow political activities on a level playing field has also received a score of 57.8% that indicates that compared to the pre-electoral environment leading to 2013 General Election where parties were unable to hold public rallies, the scenario has been relatively stable leading up to General Election 2018. The moderate (Fair) score, however, also depicts that some political players such as Tehreek Labbaik Pakistan (TLP) are allowed a free hand to hold law and order hostage with impunity which seems to threaten some other political parties. With a little time left towards completion of the term of the 14th (current) National Assembly of Pakistan after which the country undergoes the essential exercise of electing public representatives in Pakistan’s 11th General Election in 2018, the pre-poll fairness assessment by PILDAT paints a picture of deep concern on prospects of free and fair election. Based on the assessment of perception of fairness of the pre-electoral process, PILDAT believes that if the current trend of the perception of unfairness continues, the prospects for the fairness of remaining phases of the electoral process will also be jeopardized. Pakistan is better prepared than at any other time in its history to hold free and fair election in terms of the constitutional, legal and administrative capacities of the Election Commission. While an unfair pre-election process will have implications on the fairness of the electoral process, the coming General Election can still be held in a free and fair manner if the stakeholders influencing the level playing field realise the possible catastrophic outcome of a tempered election and step back from the brink. The assessment was guided by a careful review of over 70 relevant key developments over the past one year and by scores assigned by members of PILDAT Dialogue Group on Civil-Military Relations (DGCMR) using a framework devised for this purpose. Complete Score Card on Perception of Pre-Poll Fairness can be accessed here.